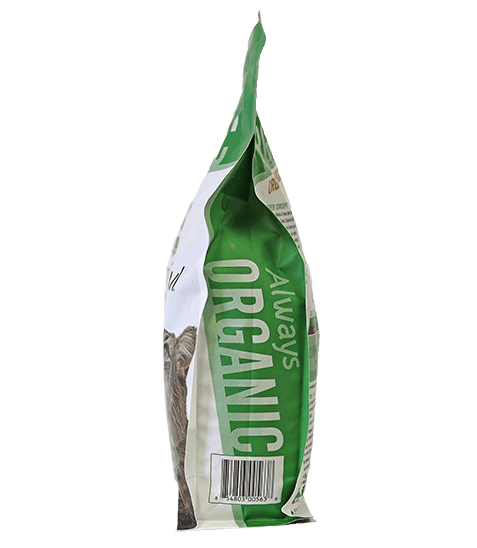 We start with U.S. raised USDA Certified Cage-Free Organic Chicken as the #1 ingredient. Our recipes are made with a precise blend of natural ingredients, antioxidants, vitamins and minerals expressly blended for optimal nutrition. 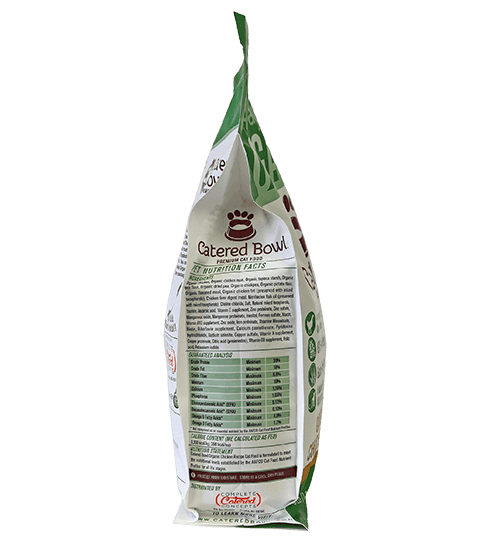 Organic chicken, Organic chicken meal, Organic tapioca starch, Organic pea flour, Organic dried pea, Organic chickpea, Organic potato flour, Organic flaxseed meal, Organic chicken fat (preserved with mixed tocopherols), Chicken liver digest meal, Menhaden fish oil (preserved with mixed tocopherols), Choline chloride, Salt, Natural mixed tocopherols, Taurine, Ascorbic acid, Vitamin E supplement, Zinc proteinate, Zinc sulfate, Manganous oxide, Manganese proteinate, Inositol, Ferrous sulfate, Niacin, Vitamin B12 supplement, Zinc oxide, Iron proteinate, Thiamine mononitrate, Biotin, Riboflavin supplement, Calcium pantothenate, Pyridoxine hydrochloride, Sodium selenite, Copper sulfate, Vitamin A supplement, Copper proteinate, Citric acid (preservative), Vitamin D3 supplement, Folic acid, Potassium iodide. ^ Recommended guidelines. Individual amounts may vary depending on animal activity and overall health and age. * Use standard 8 oz measuring cup; there are approximately 100 g (4 oz) per cup. Kittens up to 6 months may require up to 2 to 3 times more food than adult cats the same weight. Either free feed or feed 3 to 4 times daily during first year. 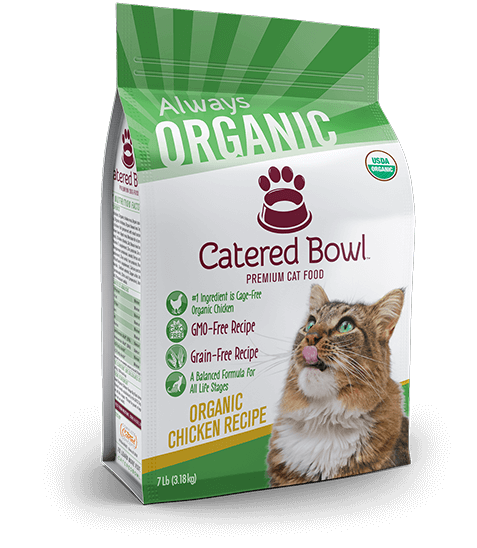 Pregnant and lactating cats should be fed free choice. 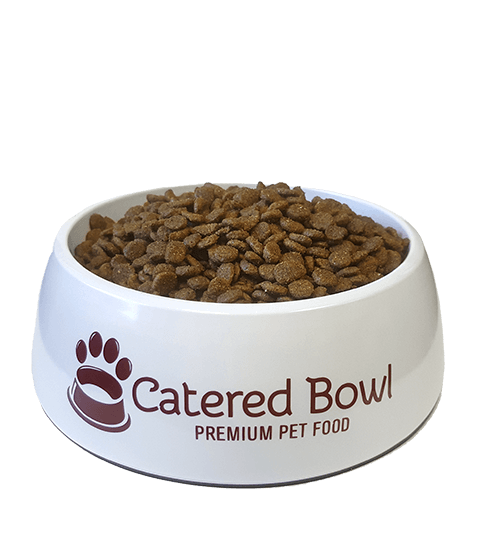 Senior and overweight cats may be fed a reduced amount, depending on the cat’s weight and activity level. 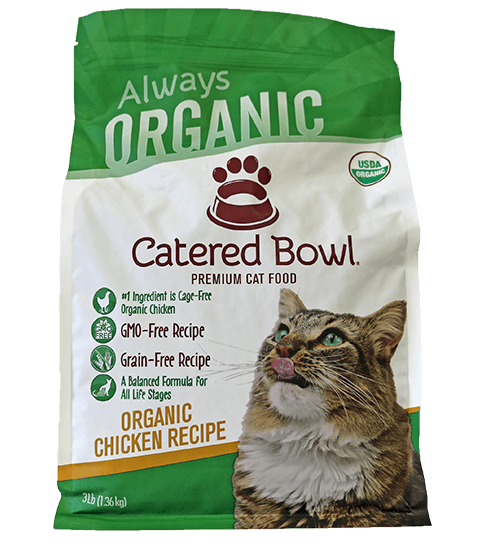 Grain-free diets may not be suitable for all cats. If you have any dietary concerns, please consult your veterinarian. 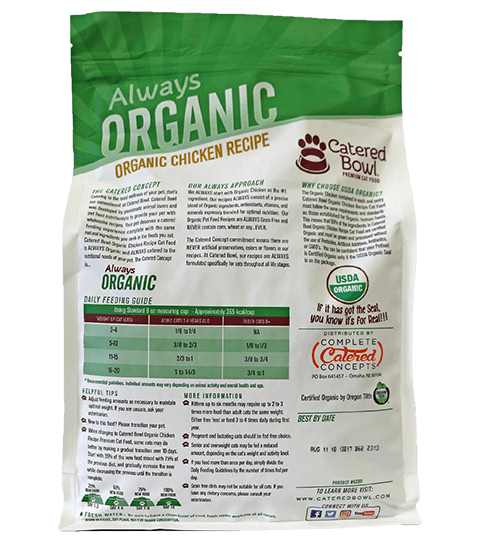 When changing to Catered Bowl Organic Chicken Recipe Cat Food, some cats may do better by making a gradual transition over 10 days. Start with 25% of the new food mixed with 75% of the previous diet, and gradually increase the new while decreasing the previous until the transition is complete.